Since the age of 14, Chuck Colbert has been learning the ins and outs of the plumbing industry. His career as a plumbing technician started alongside his dad, going along on service calls and learning the trade. After high school, Chuck went into plumbing at the same company his dad worked for, working alongside him just like he had as a teenager. After 19 years, Chuck went looking for something different, that’s when he found Chapman. Chuck is the go-to resource for all things plumbing and doesn’t hesitate to explain things in detail. 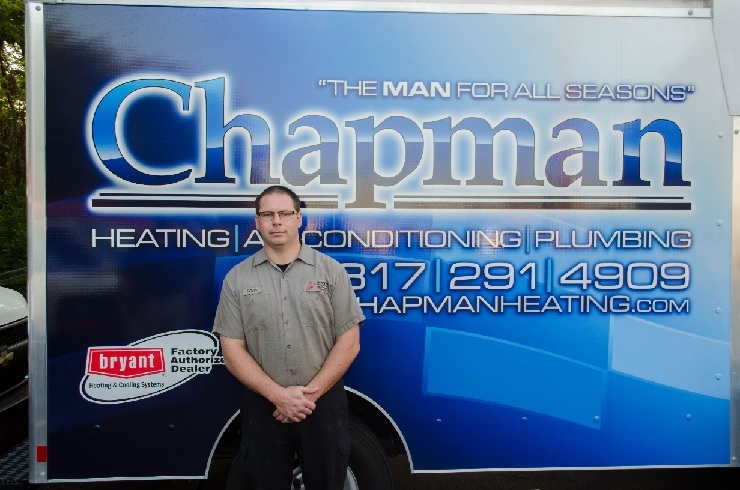 When we asked Chuck a few questions about common plumbing issues, he had a lot of knowledge to share from his years as a plumbing professional. Outside of work Chuck likes working with cars. Currently, he’s working on restoring a 1990 Suburban. Chuck was raised working on cars and any opportunity he has to work with his hands, he takes. He stays busy with 3 kids and spends a lot of his time with his daughter at the softball diamond. It doesn’t seem like there would be much time left in Chuck’s schedule for anything else, but he is also a volunteer firefighter and EMT. He has been volunteering since he was 14, giving time to help others is a big part of Chuck’s life. We’re lucky to have such a knowledgeable technician taking care of our clients and contributing to our community. If it’s time to have your pipes looked at, give us a call and schedule an appointment for Chuck to come assess the plumbing in your home.